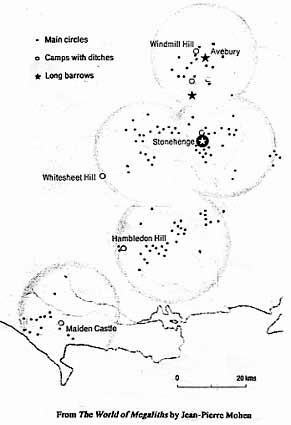 The Prehistoric monuments near Stonehenge lie in five regularly spaced groups representing the three main styles of construction: long barrow, camp with circular ditch, and large ring of standing stones. All lie in open limestone country between wooded clay banks, and accurately mirror the patterns of settlement around 2000 B.C. in an area covering no more than about 100 kilometres at any point. Each of the five concentrations is known as a territory, about 20 kilometres across. Each contained between 3000 and 8000 individuals under the leadership of one family who arranged the construction of the largest funerary monuments. Were there any links between political and military powers, under this divided system? The central site of Stonehenge, whose construction demanded considerable numbers of workers, can be seen as a symbol of the unifying strength of a very powerful price. The single tomb under the mound of Bush Barrow, built near Stonehenge at the beginning of the Bronze Age, may mark the grave of one of these important individuals, buried with his treasure and his sceptre. At Stonehenge the divisions between temporal and religious powers may have been blurred. The isolation of ceremonial sites such as the great circles of standing stones, the complexity of initiatory knowledge based on celestial observation  everything seems to indicate that the two sources of power were separate, even if religious faith depended on the protection of temporal strength.